Melting snow and rain caused drainage ditches in the Clayton area to reach capacity Wednesday morning. DAYTON — Rising temperatures paired with rain developing in the area Tuesday night brought rising water levels. 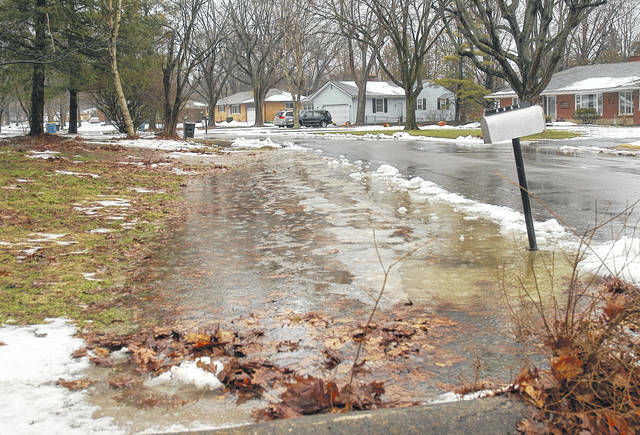 While Dayton’s downtown area has been cleared of potential drainage blockages, officials are asking residents to help out in their neighborhoods to prevent flooding. “You’re going to see the Great Miami River come up. Probably here, in the Dayton area, it will be maybe four feet higher than where you see it right now,” says Mike Ekberg of the Miami Conservancy District. He says this is a typical winter weather pattern and is a routine event for them. He added that some of the trails near river banks may be under water, but they are expecting no issues. As far as melting snow along roadways, David Shade with the City of Dayton’s Water Field Operations says crews were out on Sunday after the snow stopped, working to prepare for this warm-up. “We work in conjunction with the Public Works group and we clean the area in front of the catch basin to allow the water to drain,” he said. However, they focus primarily on the downtown area. Shade is encouraging residents to help out throughout the remaining areas. “We do have over 22,000 catch basins, so we can’t get to all of the catch basins. But if a resident, while they’re cleaning their driveway or sidewalk, if you could just clear a path for the water to get into that storm catch basin in front of your home, that will help the condition of the street in front of your house,” he said. Shade also says if you know an elderly person or someone with a disability that lives near a catch basin, try to help them out and check on theirs.